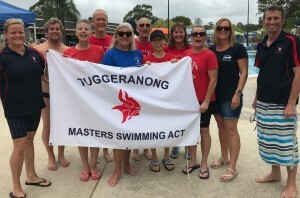 It was a wonderful way for the Tuggeranong Vikings Club to start the Masters Swimming 2019 racing season with a trip up the highway to Campbelltown for the first Branch Point Score (BPS) meet of the year. No toll fees or traffic congestion to contest with, just fellow Masters – like minded swimmers, from a total of 29 clubs. The Vikings team had eleven swimmers: Katrina Burgess, Donna Campbell, Brian Curtis, Nicholas Grinter, Kylie Lane, Paul Maggs, Caroline Makin, Atsuko McGowan, Richard Phillips, Anne Reid and Anne Smyth. And, we smashed the competition, winning the Average Points per swimmer, with a score of 39.1 points per swimmer from a maximum of 40! This is an incredible achievement and only achieved because all eleven Vikings swam their maximum number of four swims. The club also achieved fourth place on overall club points. Definitely worth huge congratulations…. very well done team! With the heat wave the East Coast had been experiencing, the water temperature in the 50m outdoor pool at Bradbury was a warm 30 degrees! Other highlights of the meet included the friendly duck that swam alongside many swimmers during the day, and even helped out the officials with some refereeing. 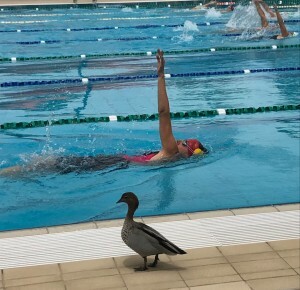 The duck even managed to get his/her own story on the MSNSW website! •Three Vikings club records – two to Brian Curtis and one to Nick Grinter. •Age championship wins to Atsuko McGowan and Caroline Makin. •Both the Women and Men’s medley relay teams winning their age groups. •But the number one highlight was watching Brian race his 50m butterfly. His children and his teammates watched him make the swim without taking a breath, and in a time of 30s! Post race he stated, however, that he won’t be attempting this again anytime soon and will go back to his usual one breath per 50m! Congratulations and a big thank you to all eleven swimmers and support crew for an enjoyable and very successful excursion.